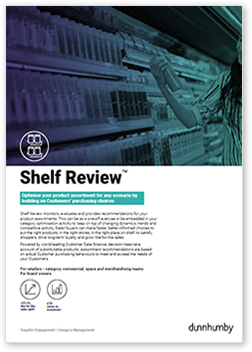 Shelf Review monitors, evaluates and provides recommendations for your product assortments. This can be as a one-off exercise or be embedded in your category optimisation activity to keep on top of changing dynamics, trends and competitive activity. Powered by world-leading Customer Data Science, decision trees take account of substitutable products. Assortment recommendations are based on actual Customer purchasing behaviours to meet and exceed the needs of your Customers. Retail buyers can make faster, better-informed choices to put the right products, in the right stores, in the right place on shelf, to satisfy shoppers, drive long-term loyalty, and grow like-for-like sales. Our clients achieve a healthy average of x10 ROI. Retailers are under real pressure to grow their sales and share against a backdrop of increasing competition and low category growth. There are constraints on the number of products that can be stocked due to store and supply chain limitations. Traditional approaches to assortment can delist the wrong products, and the cost reductions are outweighed by the larger sales loss. Actual Customer purchase data allows us to understand when product substitutions happen. Shelf Review is automated and data-led. The add-order engine builds efficient recommendations based on a Customer relevancy score, maximising Customers visiting the category to drive total store sales. Optimises the assortment recommendation based on the three drives of coverage, performance and relevance. Understanding different Customer needs in a category is essential to building a balanced assortment. Products are clustered based upon how substitutable they are with each other and groups of products are then defined as need states. When the need states are defined, the user can build a full Customer decision tree, understanding how Customers shop that category and what are their most important decisions. The add-order engine is at the heart of Shelf Review ensuring a Customer-focused recommended range is produced. This takes into account Customer need states, product performance and store relevancy. "Despite the massive range cut, the overall impact on sales and Customer satisfaction is positive. Average uplift in sales is 2% and in volume 1.4%, whilst we've had next to no Customer complaints."